Now that the word is out and Capcom has made it official that Final Fight is making a return to Xbox Live Arcade and PSN (and thankfully not in a sequel to Streetwise, ugh), it is also doubling up with platformer Magic Sword. 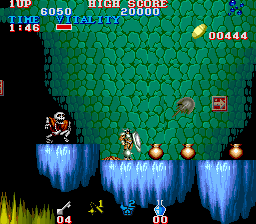 However, Magic Sword, despite its fast-paced, enjoyable action, was not always the possible choice in this bundle. Two other considerations were a “similar but not quite Magic Sword” Black Tiger or the 360 horizontal shooter Forgotten Worlds. Black Tiger is the only game in this whole set of four games that never had a home console port of any kind (multiple PCs were given a version however). It’s almost a shame that wasn’t chosen purely based on its obscurity, but obscurity does not lead to sales. Of course, there is always a Double Impact sequel to consider, right? Smithville, Mo. : sell us hospital or we take it. Modern Healthcare July 22, 1996 | Moore, J. Duncan, Jr. The town of Smithville, Mo., has pulled a grenade pin in a long-running feud with a large Kansas City, Mo.-based hospital system over the fate of the town’s community hospital. Last week, Smithville’s board of aldermen delivered an ultimatum to St. Luke’s Health System: Sell us our hospital or we take it. The aldermen made an offer to buy what used to be known as Spelman Memorial Hospital for $1.8 million. Nearby North Kansas City (Mo.) Hospital would finance the purchase. If St. Luke’s agrees to sell, the town will lease the facility to North Kansas City Hospital, which will restore full medical-surgical and emergency services. Then, in March 1995 St. Luke’s Northland Hospital shut down acute and emergency care at its Smithville campus, citing low volume and quality concerns. It moved those services to the newer suburban hospital and converted the Smithville building to skilled nursing, inpatient rehabilitation and mental health. Ever since, the town has been agitating to re-establish acute and emergency care at its hospital, which was founded in 1938 by the community. To show they mean business, the aldermen passed an authorization of condemnation the same night they approved the offer to purchase. St. Luke’s Northland spokesman John Miller said his hospital would have “to understand fully what’s being proposed” before responding to the unsolicited and unexpected offer. The Smithville facility still employs 150 people and has an urgentcare center that now sees more patients than the emergency room did before it was closed. In the last year the hospital offered acute care, the average daily census was 12 and the intensive-care unit census was less than one, Miller said. North Kansas City Hospital is well-positioned to help execute such a maneuver against longtime rival St. Luke’s. It has $113 million in reserves and no debt. It wants to become the major regional provider in northwest Missouri. Michael Payne, North Kansas City’s president, said: “Our primary goal is to make sure residents in that area have access to hospital services, acute care and emergency. “If St. Luke’s chooses to re-evaluate their decision and open the hospital as an acute-care hospital, we will finish paying for the city’s expense, then withdraw,” he said. ”We’ve accomplished our mission, which is to guarantee access to emergency services for the community of Smithville.” Moore, J. Duncan, Jr.